Home / Latest / Who's Afraid of Nixon's Anti-Semitism? As governments process the information illicitly made public by Wikileaks, the legal release of conversations recorded during the Nixon administration may seem irrelevant. Many of the recorded conversations released this week by The Nixon Presidential Library and Museum were recorded shortly before the Watergate scandal. Yet these tapes have come to public attention for their racist and anti-Semitic content. 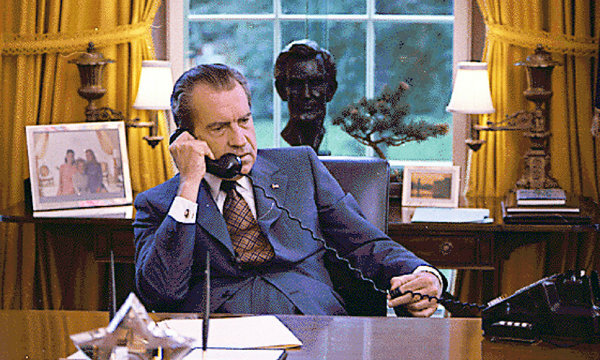 Although it is easy to draw a connection between the Nixon tapes and the Wikileaks–both call attention to the role of confidentiality within the political sphere–we must ask if this comparison is apt; whereas the former occurred in the 1970s, the latter deals with information relevant to the current state of affairs. While the Wikileaks contain actionable information, the White House tapes leave us wondering: what do we do with this new knowledge? On one hand, we have reason to condemn Nixon and Kissinger for their anti-Semitic statements (especially Kissinger for choosing realpolitik over his own Jewish heritage). Yet what if we propose a radically different approach to this story, one of forgiveness rather than censure? The tapes are four-decades old, reflecting opinions that are no longer relevant to current politics. New information is only relevant insofar that it can be applied to politics occurring in real time. Instead of wasting our breath on the past, we should focus on the future. With that in mind, perhaps the release of these tapes can inform our approach to the Wikileaks controversy. This material is more current, with a greater bearing on international politics as such. For example, a recently released document illustrates American efforts to curb Venezuelan geopolitical influence in 2008. Considering our earlier model, the Venezuelan government has two options: react with indignation, or recognize this document as a discreet historical event, consider its implications, and develop new policies that address these issues. The past cannot be changed, however recent; as such, it would be a better expenditure of time and energy to move our conversation from injury to productivity. How can this information inform current policy? We must challenge ourselves to move the rhetoric from reflection to progress, from a focus on past events to the formation of our shared future.